Identical twin brothers, Jerry Lynn and Terry Lynn, make up the artistic duo known as “Twin” and theirs is one of the most incredible stories in the art industry. Each brother is a talented artist in his own right, but it’s their collaborative painting technique that has captured the att ention of major collectors, institutes, and organizations across the country. Both artists paint on the same canvas at the same time to produce vibrant, highly textured images that are so succinct in technique and style that it cannot be distinguished as a collaboration by two artists. A true artistic phenomenon, the painting styles and techniques of Twin are as connected as their physical presence. Born and raised in the suburbs of Memphis, Tennessee, the artists were highly infl uenced by the vibrant sounds of blues and jazz, which carries into their art. First published in 1995, the collaborative paintings of Twin are an overwhelming success. Off ering a wealth of versatility, both artists are profi cient at realism as well as abstract painting styles; working in oil or acrylic; and fi ne art print making. The brothers have accomplished much over the past two decades, including exhibitions in some of the country’s top art shows, but they’re not resting on their laurels. Twin have been the offi cial artists of the Essence Music Awards, The Tom Joyner Foundation Cruise, The Kentucky Derby Grand Gala, Black Enterprise Golf & Tennis Challenge and The Links, Inc., to name just a few. 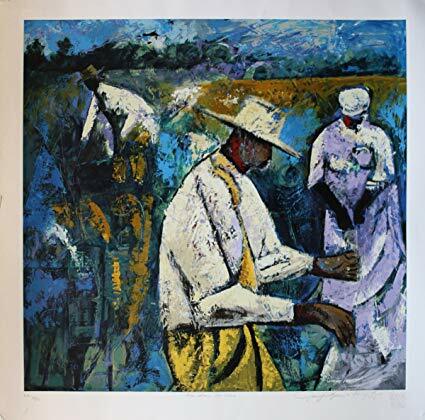 They have also been featured at the renowned Black Fine Art Show in New York. Extremely low offers will not be considered. Please do not make offers if you are not serious about buying this item. 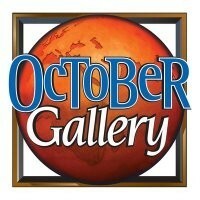 An October Gallery ArtPro will respond to you as soon as possible. If you prefer a telephone follow up, please leave your phone number.